“Ele’s Sooo Good Burritos and Green Chile” is HOT! 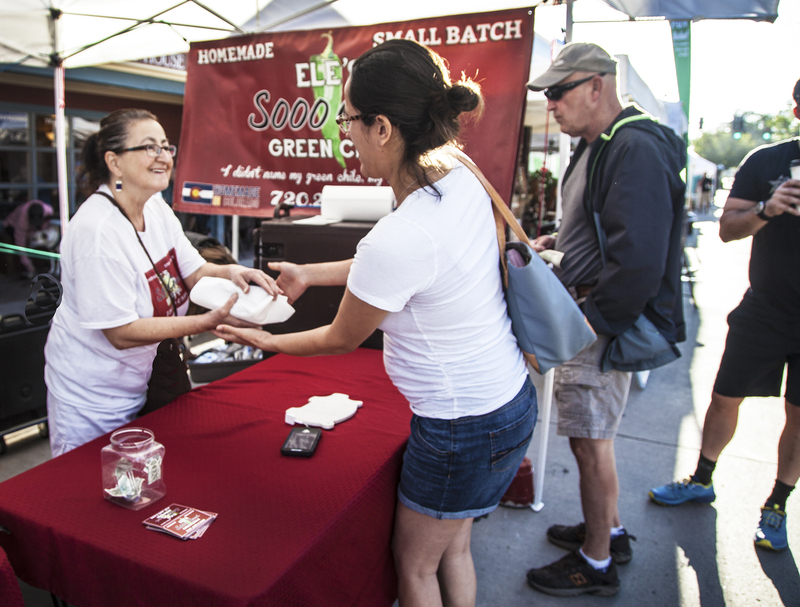 Get down to the Parker, Colorado Farmer’s Market before it’s too late to enjoy a delicious breakfast or lunch burrito by Ele made with her secret green chile recipe, hot or mild. Located in front of the Fika coffee shop on the west side of Main Street in downtown Parker, Ele’s Sooo Good Burritos—formerly “To Your Door Burritos by Ele”—frequently has 30 to 40 people lined up by the time the market opens at 8am, so get there early! Ele always sells out. Made by a “nice Jewish mom,” Ele’s burritos are a labor of love that started when she worked at a local Coldwell Banker office and brought burritos to weekly sales meetings because she wanted to cook for her friends and co-workers. “I just love feeding people,” Ele gushes. One day, a co-worker suggested she start charging for her tasty snacks. So Ele began taking orders at $5 a pop, and before she knew what had happened, a business was born with 10 different burrito varieties made with Select New Mexico’s fresh frozen Hatch green chile. In addition to her booth at the Parker Farmer’s Market which runs until the end of October (weather permitting), Ele delivers burritos daily to employees at the Tuscany and other office buildings in Parker. She also sells her homemade green chile through local retail specialty shops in the Denver area including The District Shops in Cherry Creek.